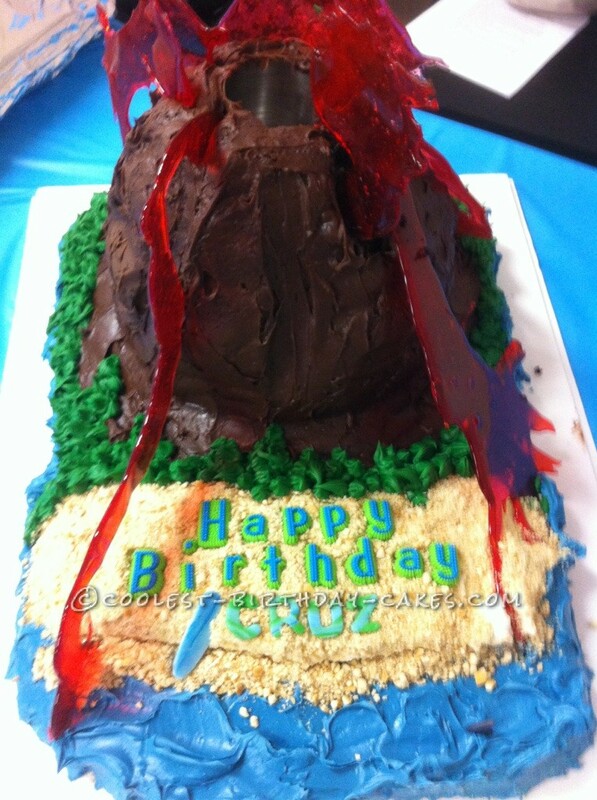 My grandson wanted a volcano cake for his birthday, but not just any volcano cake: he wanted his to ERUPT!!! So, after spending several hours searching the internet (including Coolest Birthday Cakes) and looking through cookbooks, I decided to tackle the project. I baked two oblong cakes using cake mix, one white and the other chocolate to satisfy everyone’s appetite. I placed them side by side and iced them together. I baked one 9 inch round, one 8 inch round and two 4 inch round cakes for the volcano. I placed the rounds on one end of the oblongs and used icing between the layers and candy sticks to stabilize them. This cake was so big (and heavy) that I used a piece of foam craft board trimmed to size for the cake plate. Next, I trimmed the rounds to look like a volcano and its hollows, and I trimmed the oblong cake to resemble an island with a beach. Next, I crumb-coated the entire cake and chilled it for several hours. I used chocolate icing (which is already brown) and iced the volcano. I dyed some white icing green and some blue. I piped the green icing around the perimeter of the volcano to represent trees and foliage, iced the beach with white, and iced completely around the “island” with blue for the ocean. I crushed vanilla wafers into a fine texture and sprinkled them on the “beach” for sand. I made a little black shark fin from fondant and placed it in the ocean waves. I used candy “Happy Birthday” letters purchased from the store and made fondant letters to spell “C-R-U-Z” and a little surfboard. I placed the letters and the surfboard onto the beach. I cut out a section from the inside of the volcano and placed a small metal cup into the cake. More about that later. Next, I made the lava. Using a candy thermometer, I boiled one cup of sugar, 1/2 cup light Karo syrup and 1/4 cup water until the mixture reached 295 degrees. I removed the mixture from the heat and stirred in red food coloring until the desired color was reached. I then poured the mixture onto foil lined cookie sheets in randomly shaped spews and puddles. After cooling, I placed the “lava” onto the cake. When it was time to blow out the candles, I placed a small bit of dry ice into the metal cup hidden inside the volcano and added a small amount of warm water. The cake began to SMOKE! We lit the candles and the cake was ready. Cruz loved his cake, and the kids were all excited! They ate the cake and the lava, too! This cake had a lot of steps, but none were particularly difficult. It was a large cake and could possibly be made somewhat smaller, but we fed over 40! It was a big hit!